Wow, I'm really glad to have this past season finally over. I did nine PWD workshops this past season starting in January and ending in April. I did our scout's shop's champ camp, ran two Pack level races one District race and one Girl Scout District race. Finally relaxed enough to get some pictures of this seasons cars and post them here at Derby Talk. My oldest daughter took second place in the official Gril Scout District race with this car pictured below. It is a rail rider using tungsten cubes for weighting. She did most of the work on it this year. This next picture is of her outlaw car. 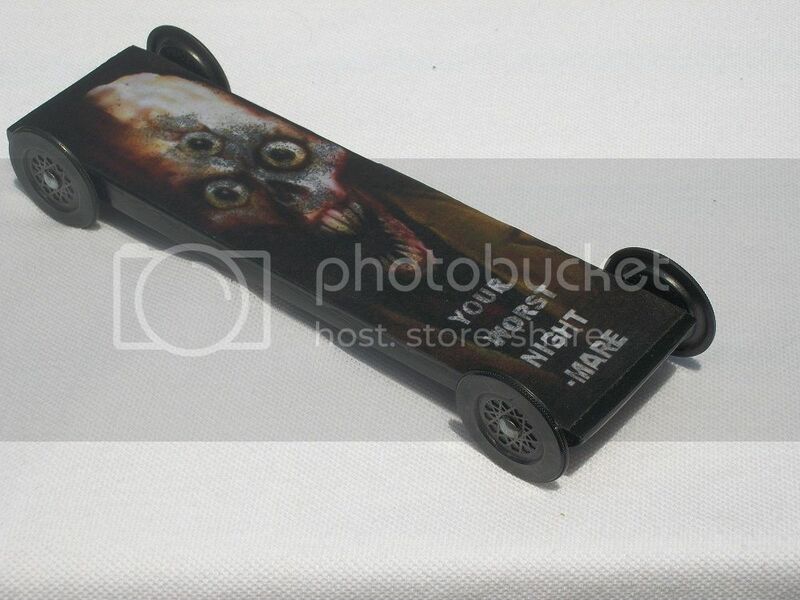 We were going to thin the wheels and make razor wheels for the car, but decided not to since we are the only ones who really take it to that level. 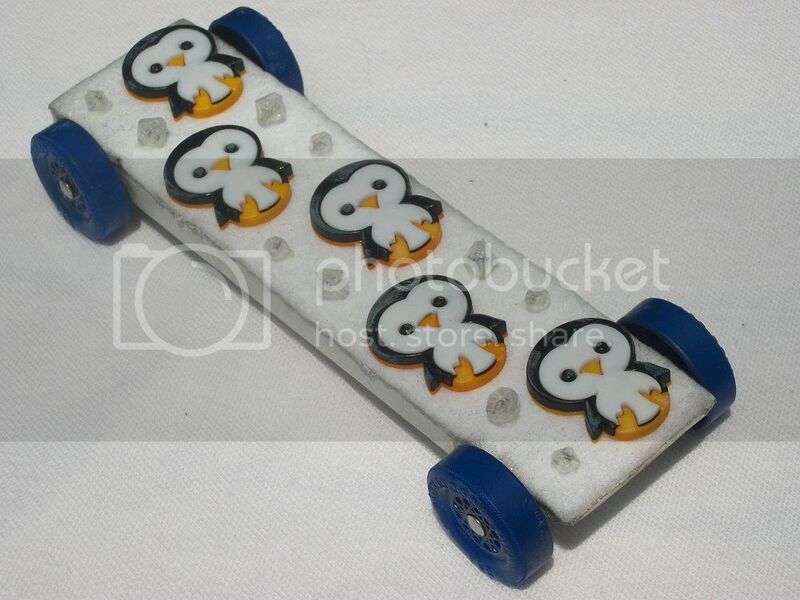 Instead we just went with standard wheels and made a rail rider out of it, but weighted with lead. It didn't make the cut and came in about 6th place in the outlaw division. This is my youngest daughters car. She made tenth place in the officail Girl Scout District race. The car is a rail rider with lead weighting. It is covered in a cottonish fabric that gives the snow like appearance behind the penguins. I have a feeling that fiber from this fabric is what slowed her chances at winning this year. We had done a car a few years back that looked like a rainbow rising up out of the clouds. We used cotton balls for the clouds and the car ran poorly that year as well, so in the future I think we wil try to stay away from cotton ball like materials. This is my youngest daughter's outlaw car. It is a rail rider weighted with lead. This car actually took first place in the Girl Scout youth outlaw division. This next car is my car. It is a rail rider weighted with tungsten. 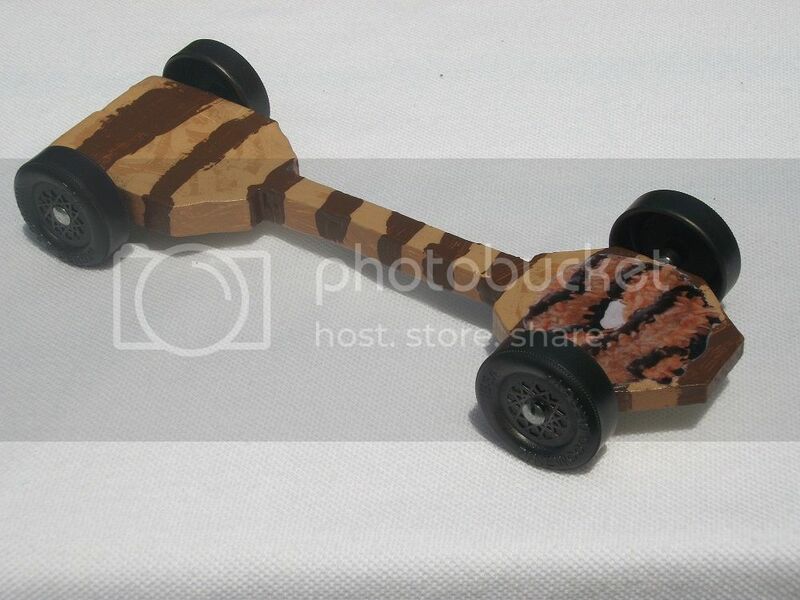 The wood weight on the car came to about ten grams and it is the lightest car I've ever created. I basically made an open ladder frame and covered it with a 1/32nd thick piece of hobby plywood. I actually broke the frame twice while cutting it out on the scroll saw. A little wood glue and clamps, and it was back to normal in no time. I cut down the wheels to make BSA razor wheels. It took first place in the adult outlaw division. My wife made a simular car, but just painted it a solid green (nothing special). It took second place in the adult outlaw division, right behind my car. 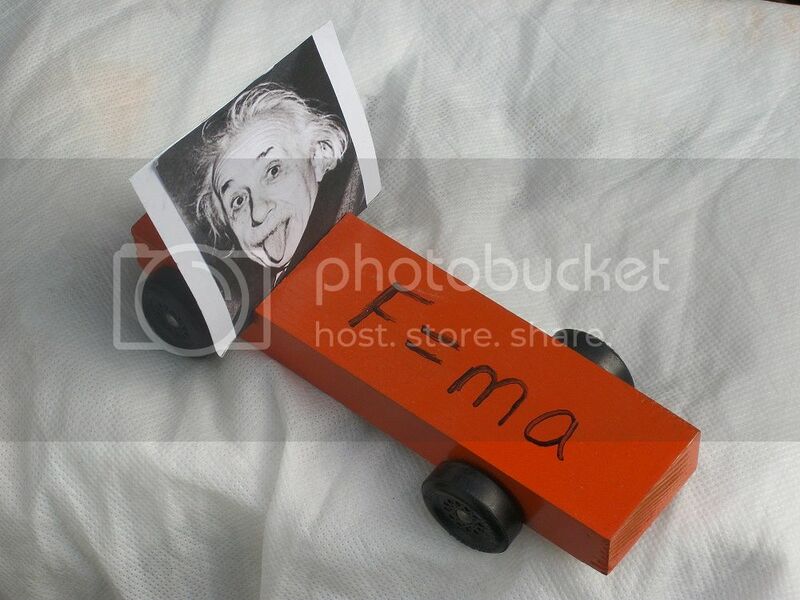 This last picture is of my youngest daughter's Einstein car. 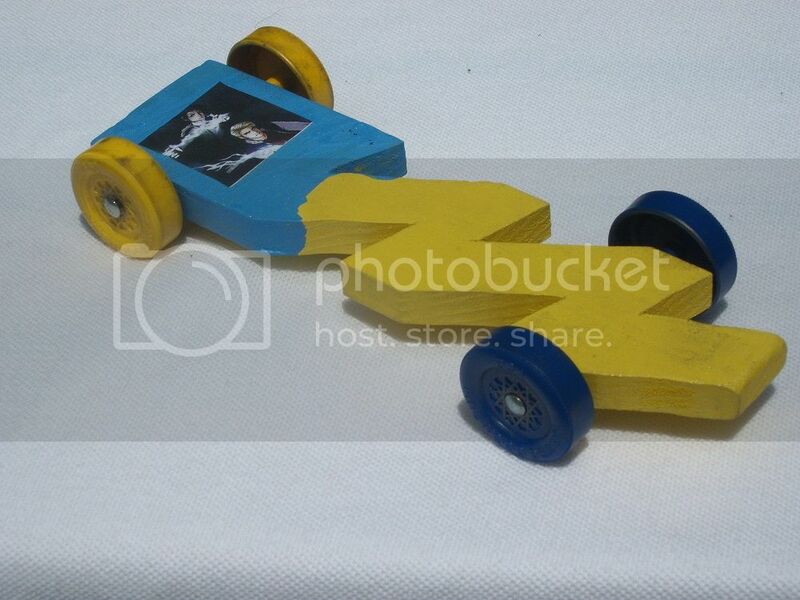 She ran this in the Cub Scout Einstein Race (slowest car wins) at this years district race. Her car was actually the slowest car there, unfortunately it would stop about twelve inches short of the finish line on each run. Without it being able to finish, it would have to take a loss for each run, eliminating it early in the competition. All the other cars in the competion (about 20) were able to cross the finish line, only hers couldn't do it. 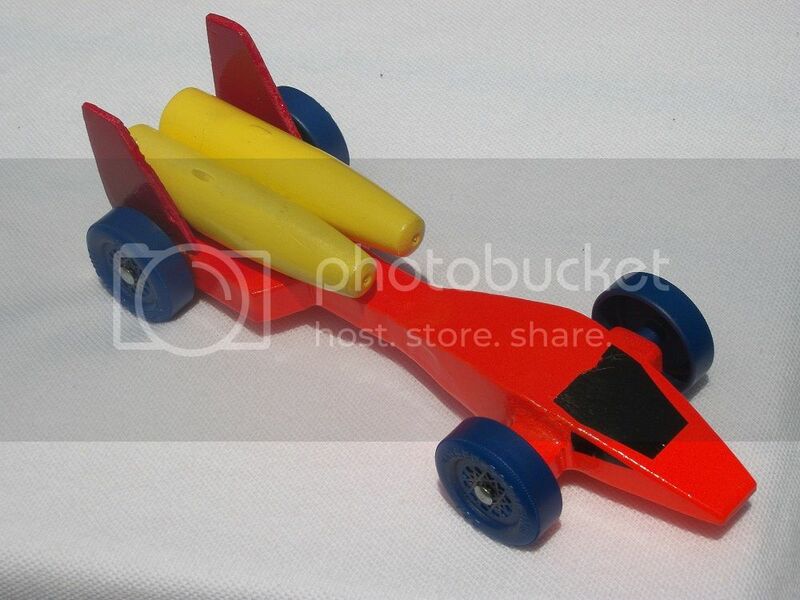 So they announced her as the slowest car, but not as a winner. We do realize that formula on the car is actually Newton's not Einstein's, that's just how my daughter wanted it. Oh, and yes, that is a picture of Albert Einstein sticking his tongue out. Very nice line-up of cars.. Nitro Dan. Very cool. I always like seeing your family's builds, ND. I hope your car didn't give anybody bad dreams!